Ora Ito and marble specialist Citco will unveil Venus chair next month during Milan furniture fair. Over the last 20 years, 1997-2017, Ora Ito has constructed a sensual and rational expression of volumes adapted to suit each function. 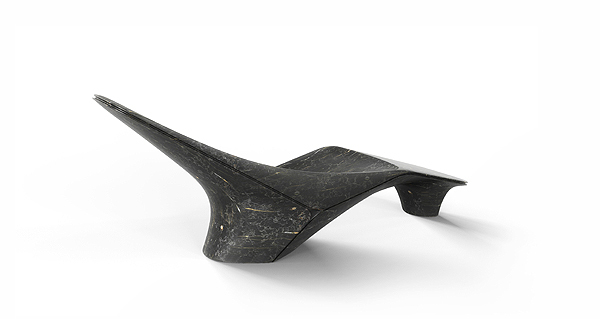 This sculpted chaise longue, Venus, is part of his DNA. A Venus with imperious vivacity that is disconcertingly asymmetrical. This is a celebration of drawing in space by a visual designer who digitally sculpts marble, centimetre by centimetre, with amazing dynamic precision. The best of the Italian craft industry meets streamlined vitality. The biomorphic and polished curves, rising and falling, precariously floating from one side to the other, cry out to be caressed. The block of marble is grooved by a shadow gap that traces a rational line along its organic shape, highlighting its practicality and ergonomics, as well as controlling its rashness. The bare marble version of Venus is by nature intended for gardens and terraces and to add comfort for the indoor version the fibreglass shell is lined with leather. Available in different types of marble.